In 1998 a tank from the Great War was unearthed on Flesquières ridge in northern France. The tank was later identified as the British Mark IV Deborah D51, which took part in the 1917 Battle of Cambrai. Philippe Gorczynski, responsible for this remarkable find with other local people formed themselves into the Association Tank de Flesquières. 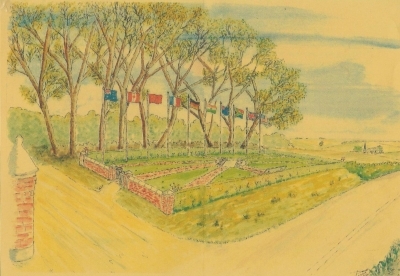 Encouraged by the subsequent intense interest shown by many international visitors to the area, the Association felt moved to create a lasting memorial to honour all those who fought at Cambrai during the Great War 1914-1918. At Louverval, nearly 10km from the heart of the Cambrai battlefield, there is a very moving British memorial to those missing and who have no known grave. For the 90th anniversary of the Battle of Cambrai another monument was unveiled which now allows the visitors to gain a good understanding of the history and to be actually situated where the battle took place. 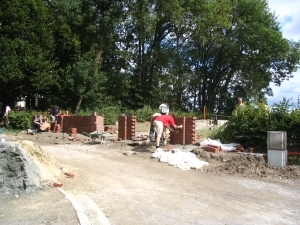 The land for the monument at Flesquières was generously made available by M. Bertrand de Valicourt. 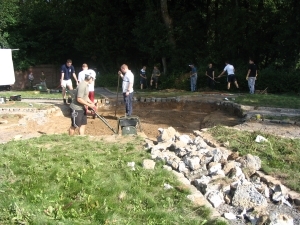 A group of volunteers prepared the ground and the basic layout. The members of the Association worked in close co-operation with a number of organisations and individuals, both in France and abroad, to progress this very worthy venture. Thanks to the many donations and voluntary assistance, the monument is now established. The village of Flesquières was at the very heart of the 1917 Battle of Cambrai and the surrounding area was fought over right up to the end of the war. Also it is now home to Deborah D51, which was discovered close to the site of the monument and is on permanent display in the village. The site could not be in a more suitable place to form a fitting tribute to the men who fought and died in the battles for Cambrai. Originally a windmill stood on the site of the proposed monument and was demolished by the German army when they built one of the main trenches of the Hindenburg Support Line. Part of the foundation brickwork of the windmill has been uncovered and this has been left in place and protected. 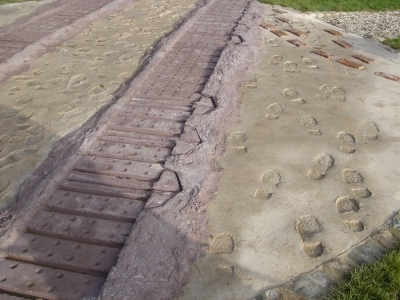 Tank track and footprints of the new Monument at Flesquieres. Argyll and Sutherland Highlanders, Army Chaplain's Department, Army Cycle Corps, Army Gymnastic Staff, Army Ordnance Corps, Army Pay Corps, Army Service Corps, Army Veterinary Corps, Bedfordshire Regiment, Bedfordshire Yeomanry, Black Watch, Blackheath and Woolwich London, Border Regiment, Buffs East Kent Regiment, Cameronian Scottish Fusiliers, Canadian Corps, Canadian Expeditionary Force, Canadian Field Artillery, Caribiniers Dragoon Guards, Caribiniers Prince of Wales Dragoon Guards, Central India Horse, Cheshire Regiment, City of London Regiment, City of London Rifles, City of London Royal Fusiliers, Coldstream Guards, County of London Regiment, Deccan Horse Lancers, Devonshire Regiment, Dorset Regiment, Duke of Cambridge's Own Lancers, Duke of Cornwall's Light Infantry, Duke of Wellington's Regiment, Durham Light Infantry, East Lancashire Regiment, East Surrey Regiment, East Yorkshire Regiment, Essex Regiment, Essex Yeomanry, Fane's Horse Lancers, First Aid Nursing Yeomanry, First Surrey Rifles London, Fort Garry Horse, Gardner's Horse Lancers, Gloucestershire Regiment, Gordon Highlanders, Grenadier Guards, Guards Machine Gun Regiment, Hampshire Regiment, Herefordshire Regiment, Highland Light Infantry, Hodson's Horse, Hussars 20th, Inniskilling Dragoons, Irish Guards, Jacob's Horse, Jodhpur Lancers, Kensington London, King Edward's Horse, King George's Own Lancers, King's Hussars, King's Liverpool Regiment, King's Own Hussars, King's Own Royal Lancaster Regiment, King's Own Yorkshire Light Infantry, King's Royal Irish Hussars, King's Royal Rifle Corps, King's Shropshire Light Infantry, King's Own Scottish Borderers, Labour Corps, Lancashire Fusiliers, Life Guards, Lincolnshire Regiment, London Irish Rifles, London Rifle Brigade, London Scottish, Lord Strathcona's Horse, Lothian and Border Horse, Loyal North Lancashire Regiment, Machine Gun Corps, Manchester Regiment, Middlesex Regiment, Military Foot Police, Military Mounted Police, Monmouthshire Regiment, Norfolk Regiment, North Somerset Yeomanry, North Staffordshire Regiment, Northamptonshire Regiment, Northumberland Horse, Northumberland Yeomanry, Oxfordshire and Bucks. Light Infantry, Poona Horse, Poplar & Stepney Rifles London, Post Office Rifles London, Prince Albert's Own Hussars, Prince of Wales's Dragoon Guards, Prince of Wales's Own Civ. Serv. Rifles London, Prince of Wales's Own Royal Hussars, Prince of Wales's Royal Lancers, Princess Charlotte of Wales Dragoon Guards, Princess Royal's Dragoon Guards, Queen Alexandra's Imp. Mil. Nursing Service, Queen Alexandra's Own Royal Hussars, Queen Mary's Own Royal Hussars, Queen's Bays Dragoon Guards, Queen's Lancers, Queen's London, Queen's Own Hussars, Queen's Own Royal West Kent Regiment, Queen's Royal Lancers, Queen's Royal West Surrey Regiment, Queen's Own Oxfordshire Hussars, Queens Victoria Rifles London, Queen's Westminster Rifles London,Rangers London, Rifle Brigade, Royal Army Medical Corps, Royal Berkshire Regiment, Royal Canadian Dragoons, Royal Dragoons, Royal Engineers, Royal Field Artillery, Royal Flying Corps, Royal Fusiliers, Royal Garrison Artillery, Royal Guernsey Light Infantry, Royal Horse Artillery, Royal Horse Guards, Royal Inniskilling Fusiliers, Royal Irish Dragoon Guards, Royal Irish Fusiliers, Royal Irish Lancers, Royal Irish Rifles, Royal Lancashire Regiment, Royal Leicestershire Regiment, Royal Newfoundland Regiment, Royal Northumberland Fusiliers, Royal Scots, Royal Scots Greys Dragoons, Royal Sussex Regiment,Royal Warwickshire Regiment, Royal Welsh Fusiliers, Scots Guards, Scottish Horse, Seaforth Highlanders, Sherwood Foresters Notts. & Derby Regiment, Somerset Light Infantry, South African Fusiliers, South Lancashire Regiment, South Staffordshire Regiment, South Wales Borderers, St.Pancras London, Suffolk Regiment, Tank Corps, Welsh Guards, Welsh Regiment, West Somerset Yeomanry,West Yorkshire Regiment, Wiltshire Regiment, Worcestershire Regiment, York and Lancaster Regiment, Yorkshire Regiment.